Worthless, but very useful for DIY enthusiasts especially in wiring. This is my custom made Test Light. I use 12-volt bulb, wire and safety pin; easy for me to poked into wrapped wire without cutting or spoilt the wire wraps. 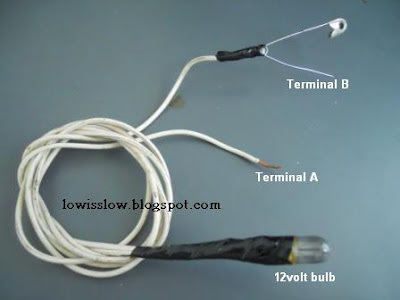 The function of Test Light is to find the suspected wire. For example, to find ACC/ON wire, tap the terminal A to the metal vehicle body/part (-ve), and terminal B (safety pin) poked into the suspected wire. If the test light's bulb lights ON when you turn the ignition key to ACC/ON position, that it is. You also can use multimeter for this job. M-oil from spark plug port bro? try tighten the sparkplug. M-oil supposed not goes to the spark plug. If the exhaust got a lot of white smoke, maybe the engine head cracked. Better clean up the area (oil leak) first, and wait for 1/2days check back where the actual source of the leak. Blogs that have quality information like this are as precious as gold. You have given me much to think about in this blog. Thank you. Test light is a good trick. Short home made trick this one. Very interesting idea this one. Thank you for your nice sharing. The 3 individual meters contained within the multimeter area unit the meter, that measures current, a meter, that measures voltage potential distinction between 2 points, associated an meter, that measures resistance Garatools.com. It is the easy and also rapid method making call with client service personnel. Hotschedules Login It made checks and balance very easy for a manager forever performance of personnel. Thanks for sharing this kind of stuffs.